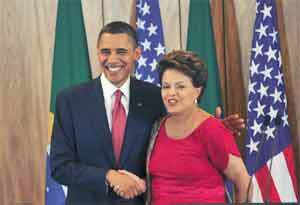 Brazilian President Dilma Rousseff visits the United States on June 29-30 at a very interesting juncture. She gained reelection last year in a tough fought battle on the heels of a year that saw huge social unrest and protests over the costs the nation incurred in the ramp up to the World Cup. The performance of the Verde-Amarela in the World Cup will go unmentioned. host of issues. Indeed, bilateral cooperation on education, but also energy and climate deserve significant space on the two leaders’ agenda. Reinvigorating and moving ahead on several energy and climate initiatives would render the meetings in DC a success and provide ample vigor for continued forward progress between the two nations. The details of the Car Wash corruption scandal are unlikely to make it on the formal agenda, but its presence will be felt not least because Brazil’s precarious financial position is heavily influenced by the how the scandal has rocked the national oil company Petrobras. But the good news is that corruption scandals aside, the two nations have much to offer each other in the energy sector, from reinvigorating the US - Brazil strategic energy dialogue, to cooperation on dealing with water scarcity, and the future of alternative fuels. reserves offshore looked set to catapult Brazil to energy superpower status. Five years later and fever pitch has subsided as Brazil is on track for a recession and the IMF forecasts the economy to contract by 1 percent in 2015. But, there are some silver linings for Brazil’s outlook. A great deal of progress was accomplished during the country’s economic boom. Income inequality dropped to its lowest level in over three decades, while the incomes of the poorest Brazilians grew by 7 percent. The proportion of Brazilians living in extreme poverty was reduced by half. And while Brazil’s energy sector has stumbled, there is still much potential and international interest. In 2011, on the occasion of President Obama’s visit to Brazil, the two nations created the Strategic Energy Dialogue, covering a whole host of energy topics from oil and gas development, to biofuels, to hydropower and energy efficiency. The goal, as stated in the original agreement, was both nations efforts aimed at “developing safe, secure and affordable supplies of energy for economic growth, energy security, and the transition to a clean energy economy.” There had been some progress in the first year or so of the agreement year or so of the agreement, but significant bilateral collaboration has waned for a variety of reasons. But the issues at the core of the SED are now more important than ever in Brazil given the power sector challenges and oil and gas market situation. The opportunity for trade in energy and energy-related goods and services should be made a priority for a reinvigorated bilateral energy discourse. Additionally, renewed collaboration on alternative fuels makes sense. The United States and Brazil are the global leaders. Both produce large quantities of ethanol from corn and sugarcane, supported in great part by domestic policy and biofuel mandates. However, with backlash from environmentalists over climate policy, the food vs fuel debate, and concerns over the benefit of traditional biofuels, Brazil and the United States are rethinking their approach. Research cooperation could assist both nations in moving towards a Biofuels 2.0. Monte dam have added further pressure on the system. In the United States, a sustained drought in California has raised questions about the water-energy nexus, while climate change more broadly has brought more frequent, extreme weather to the US. In the months leading up to the United Nations climate summit in Paris in December, these issues could be advanced bilaterally with an aim to bring together disparate blocs of nations as the world strives to forge a deal on climate change. Similar to bilateral efforts between the US and China, a Brazil-US led dialogue on greenhouse gas emissions would greatly support global efforts. Borrowing a page from energy integration, success at the bilateral level often drives and facilitates larger, regional agreements and thus the potential for a global accord. visit: www.iamericas.org/energy. Petroleumworld does not necessarily share these views.